Featuring a unique shape, elegant crochet stitching, and one of a kind fruit pom-poms this clutch has become a new Mar Y Sol must-have. Its playful colors and curves can compliment any summer ensemble from cut-offs and a crisp, white tee, to your favorite slinky sundress. 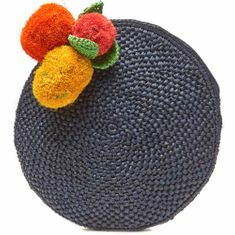 Crocheted raffia with raffia pom charms, cotton lining, inside pocket and zip closure. 10" Diameter x 1"D - Approximate dimensions, each piece is handmade.